OCEANIC/POLAR FLIGHTS AND FLIGHTS WITH ALEUTIAN CHAIN DESTINATIONS REQUESTING ABOVE FL270 CONTACT ANCHORAGE ARTCC ON FREQ 127.55 FOR CLEARANCE PRIOR TO STARTING ENGINES. ASR ELEVATION IS 164.7 FT.
A110-1 MIGRATORY BIRDS INVOF ARPT SPRING THROUGH FALL. A110-10 NOISE SENSITIVE AREA IN EFFECT; CTC AMGR AT 907-266-2525 OR APRT OPNS 907-266-2600 FOR FURTHER INFO. A110-11 TO COORDINATE NON-TRANSPONDER OR NON-RADIO OPNS CTC ANC ATCT AT 907-271-2700 DURG ADMIN HRS (0730-1600 WKDAYS). DURG NON-ADMIN HRS & HOLIDAYS CTC FAA AT 907-271-5936. A110-17 UNLGTD 489 FT TWR 2 1/2 MILES NORTHEAST. A110-2 ONE HR PPR FOR NON-TRANSPONDER ACFT OPNS. PPR FOR NON-RADIO ACFT OPNS. NO NIGHTTIME NON-RADIO ACFT OPNS PERMITTED. PILOTS MUST PROVIDE AN ETA & REMAIN WITHIN PLUS OR MINUS 15 MINUTES OF ETA. A110-20 PORTIONS OF TWY K BTN TWY H & TWY J NOT VIS FROM ATCT. A110-25 NO COMPASS CALIBRATION PAD. A110-30 RIGHT TURN OUT OF RAMP PARKING AREA R-2 THROUGH R-4 PROHIBITED. 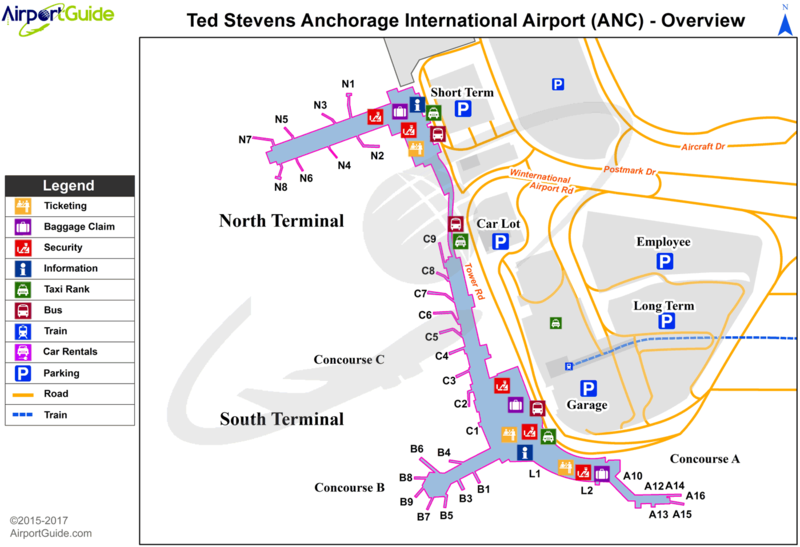 A110-33 USE FREQ 122.55 (RCO) FOR FILING, ACTIVATING & CANCELING FLIGHT PLANS IN THE ANCHORAGE BOWL AREA. A110-34 FAA RAMP PPR - CTC ANC FIFO FREQ 135.85, 907-271-2414 OR AVN 405-954-9780 MON-FRI 0600-1430L. A110-43 TWY V SECURITY GATE EAST OF TWY E; KEY 121.75 5 TIMES TO ACTVT.TWY V RESTRICTED TO ACFT WEIGHING 12500 LBS OR LESS. SUBJECT TO JET BLAST WEST OF TWY E.
A110-45 TRANSIENT MILITARY ACFT PPR. A110-46 RY 07R: BACK TXG FM TWY J FOR DEP PROHIBITED. A110-47 REMOTE PARKING SPOTS R12-14 LEAD-IN LIGHTS OTS INDEFLY. A110-48 RWY END 25L HAS 200' BLAST PAD. A110-50 ASSC IN USE. OPERATE TRANSPONDERS WITH ALTITUDE REPORTING MODE AND ADS-B (IF EQUIPPED) ENABLED ON ALL AIRPORT SURFACES. 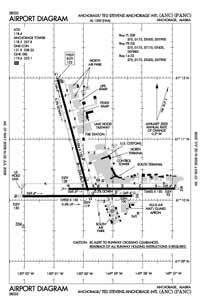 A110-51 TWYS W, M BTWN RWY 15/33 AND TWY R, U/T/S BTWN TWYS Y/R MARKINGS/LIGHTING NOT STANDARD. RWY 15/33 MARKINGS/LIGHTING NOT STANDARD. A110-52 TWY S, EAST OF TWY R NOT LIGHTED. A110-53 ALL TURBOJET/TURBOFAN ACFT DEPARTING RWYS 7R/7L DURING A RWY 15/33 CLOSURE WILL EMPLOY THE FAA CLOSE-IN NADP OR ICAO PROCEDURE B NADP WHEN SAFETY PERMITS. A110-8 FOR WSO PHONE 907-266-5105. Dual Dual Tandem Wheel Landing Gear: 900.